After a disappointing trade deadline, an unsatisfying return for Evander Kane and a season that will be yet another at the bottom of the NHL, sports comedian Jeff Wozer has seen signs that everyone in the Sabres organization is going through the motions. • Zamboni driver has now gone 11 straight games resurfacing ice with the Zamboni’s check engine light on. • Players ask officials if they can play 60 minutes of running time. 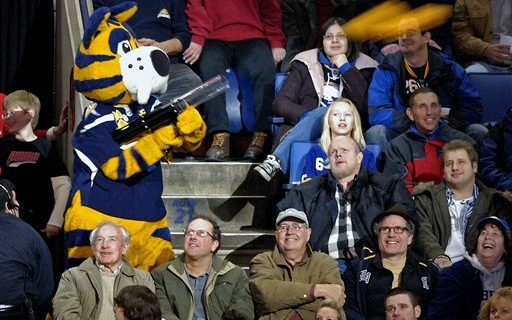 • Sabretooth spends games sitting by itself in empty 302 corner section doing word search puzzles. • Two of the three designated Moe’s Hot Players of the games are goalies. • Doug Allen sings national anthems wearing shower sandals. • Buffalo’s PA announcer is now routinely 20 to 30 seconds late announcing one minute left in the period. • Team no longer bothers to freeze pucks before games keeping them instead in locker room fridge’s crisper drawer. • Zamboni resurfaces ice using concession stands’ boiled hot dog water. • On Fan Appreciation Night team hands out umbrellas that suspiciously resemble Wegman’s courtesy umbrellas. • To staunch player’s bleeding team physician uses Dunkin Donut napkins. Jeff Wozer also discovered some of Rick Jeanneret’s pet peeves.